The actual process involves printing a digital file on special paper, using large format printers, and then heat-pressing the images to fabric using a large format rotary heat press. The end result is remarkable. Brilliant full-process color, from simple to highly complex designs, printed on several standard polyester fabrics. Dye-Sublimation inks are actually infused into the fabric. Printed on a special transfer paper, Dye-Sublimation inks turn into a gas when heated to around 425 degrees. Through heat and pressure, the ink forms a bond with the “Fibers” and “Dyes” the fabric. At this point, the product is foldable, washable and ready to be finished. 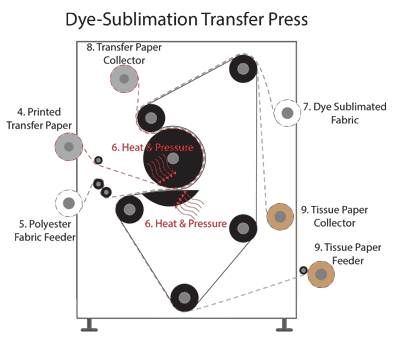 Dye-Sublimation Inks are called “Dispersed Dyes” designed to work with 100% polyester fabrics. What size can you produce? Presses vary in sizes capable of producing images 10′ wide without a seam. If larger prints are needed they can be produced in tiles and sewn back together with a “T-Shirt” seam. This type of seam is very small and hides well in large banners. Most any indoor graphics can be produced with this process. Everything from trade show displays and media backdrops to event/stage graphics, custom flags and more. Most direct printing has to be done on fabrics coated for direct print, this assures the image doesn’t bleed while printing. This coating produces a barrier between the fabric and ink. Before you have even started the job, your fabric will have memory for wrinkles and feel crunchy to the touch. Once you print to coated fabrics your ink sits on the surface of the fabric adding another layer to the fabric. This again increases the crunchy feeling of the fabric and causes the material to have more memory for wrinkles. How does Direct Print compare? It doesn’t. No richness to colors. No bonding to the fabric itself. 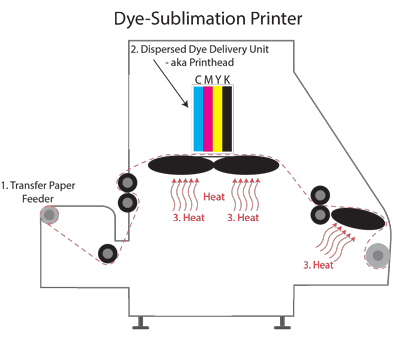 Why is Dye-Sublimation better than Direct Print to fabric? Truly continuous tones can be achieved that are equivalent to photographs, without the use of special techniques such as half-tone printing. The prints are dry and ready to handle as soon as they exit the transfer press. Dye does not build up on the fabric because it is infused into the fabric. The finished product results in material that is easy to handle, washable, and reusable. It is extremely lightweight and can be folded into a small footprint so it’s cost-effective to transport.